From 4th to 11th November 2013 will be held the 6th edition of the Week of Finance Solidarity in France. Still unknown for some people, we'll explain you what is "solidarity finance" and why it appears to be a suitable solution for solving some major challenges of our society like creation of jobs , funding businesses or support entrepreneurship through microcredit . "Solidarity finance" is a system of funding based on savings placed on based financial solidarity products . These will help finance key projects with high social and environmental benefits, finance access to housing or employment, for example. 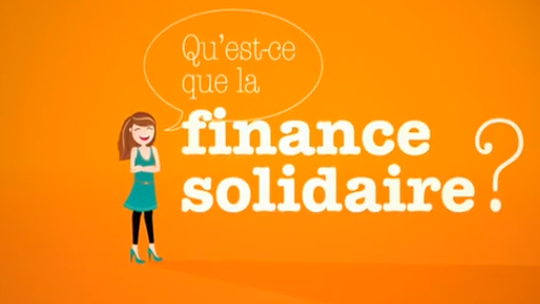 Since 2002, "solidarity finance" with more than 900,000 savers in France, has supported nearly 100,000 businesses and create or consolidate 200,000 jobs. With this funding that has meaning for all, 38,000 people were able to be accommodated or relocated to decent housing. This event appears to be a real awareness campaign to the general public to make everyone aware that it is possible to make sense of their savings and mobilize together for another finance. Program of the week: conferences, film debates, awards, gala, round-tables, and solidarity concerts this week will animate this event. To know all the events in your area: click here!